You guys, I have been honored with a nomination for the Bloggy Awards in the category of Best Fantasy review for my review of Stormdancer. If you’re so inclined, go here and vote for me. I don’t think I’ll win, but I am so touched just the same! The time has come for me to make a change to A Reader of Fictions. No, I’m not going anywhere; you can’t get rid of me! However, I am removing the music element from my reviews. There are a lot of reasons for this, but I hope that m blog will be less confusing in the future. I’m thinking I’ll do special posts about songs from time to time to make up for this change. Check out the end of the post for the Book of the Month giveaway. Check back in the middle of September for my 500 follower giveaway/blogoversary/birthday giveaway. Even though I had a ton of giveaways this month, I’m still going to do my BotM giveaway. I had two five star reads this month and I already did a giveaway for Stormdancer, so this month I’m offering a copy of Blood Red Road to one reader. It will be shipped from TBD or Fishpond (for Australian folks), so international. 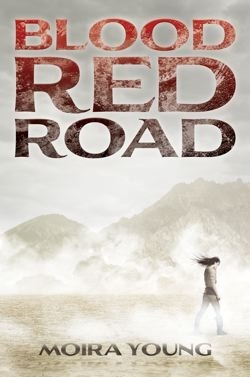 Blood Red Road is the first book that I’ve ever loved (even liked) told in dialect. If I can love it, so can you! On TBD, the cover shown on the right and the new cover are roughly the same price, so winner’s choice of which cover they want. as always — thanks for you blog. Oh, also I’m kinda sad that you’re removing the music. I’ll admit that it was a bit difficult when I’m searching the archives for a specific book but it was nice to see what songs you associate to the book. I should have a blog button at some point in the future. I hope. I don’t really have design skills, but my birthday is coming up and I’m hoping to get my designer friend to hook me up. oh well, I’ll pass and let another explore Saba’s fierceness. You are a crazy face. I’m glad to see your better side prevailed. Thanks dear! I’m kind of glad it’s over. It was EXHAUSTING. haha.